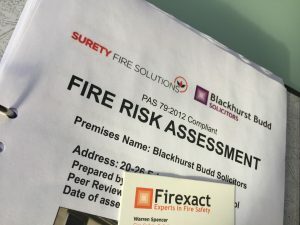 As a result of my previous article, ‘The End of Fire Risk Assessors’, I have received a number of enquiries regarding the extent to which fire risk assessors could be liable for prosecution in the event of a fire risk assessment being deemed not ‘suitable and sufficient’ by an enforcing authority. I have also been instructed to draft appropriate disclaimers, so as to limit the extent of that liability in the event of an investigation. As I outlined, any liability would stem from articles 5(3) and 5(4) of the Regulatory Reform (Fire Safety) Order 2005. However, that liability is limited to the extent to which the fire risk assessor has control over the premises in question. In addition, the fire risk assessment which is deemed to be not suitable and sufficient, must have placed one or more relevant persons at risk of death or serious injury in case of fire. It is essential, therefore, that the fire risk assessor makes the terms of his instruction crystal clear with in the fire risk assessment. It is not possible to disclaim criminal liability, but it is possible to clarify the exact nature of the assessor’s involvement with the premises. This can be done through disclaimers, which are signed by the responsible person to ensure that the RP is in no doubt about the limited control passed to the assessor. For example, if the fire risk assessor has no control over the on-going management of the premises, once the report has been completed. This must be made clear. Nor should he be responsible for the failure to implement significant findings. If the assessor is not satisfied with the amount of information he has regarding the management setup and running of the premises, he should say so in his report, or at least make clear that certain information has not been provided. The same applies to his lack of control over staffing levels. Many fire risk assessments are compiled without the assessor having had full access to the premises or an opportunity to test for fire protection or sufficient separation. Again, it should be made clear that findings may be based on visual observation only, and without appropriate surveys being carried out. This may not have been possible for a number of reasons (not least the limited fee for the assessment and report agreed with the responsible person). Reference should also be made to the requirements of third-party enforcement agencies, such as local authorities or building control and whether or not the terms of instruction extend to those aspects. Clear disclaimers should be given in respect of subsequent changes to the premises; subsequent faults in equipment; deterioration in the premises and testing requirements. It may sound obvious, but any draft or provisional assessment should be clearly marked as such. In addition to proving that a fire risk assessment was not suitable and sufficient, to succeed in any prosecution an enforcing authority would have to show that the responsible person relied entirely upon the fire risk assessment provided, and complied with its recommendations, where relevant. It would then be necessary to prove that the shortcomings of the report placed one or more relevant persons at risk of death or serious injury in case of fire. The risk does not have to be a serious risk, as is put forward by many experts. Any risk will suffice. Accordingly, the fire risk assessor must make very clear that the responsibility for the on-going management of the premises and even, if necessary, the decision to allow the premises to be used for its present purpose, remains with the responsible person. In the event of a prosecution, the first thing the court would do, is look at the nature of the retainer between the responsible person and the fire risk assessor. It is for this reason that the retainer must be clearly agreed and evidenced within the report, so that the control of the premises is minimised to its correct extent and it is clear that the fire risk assessor has not adopted any unnecessary responsibility for the premises, which should remain with the responsible person. PreviousFire Risk Assessors at Risk?